According to the Machiavellian intelligence hypothesis (or ‘social brain hypothesis’, Dunbar 1998), the driving force in the evolution of primate intelligence is social expertise, which enables the manipulation of and cooperation with other social group members (Whiten & Byrne 1988, Whiten 1999). 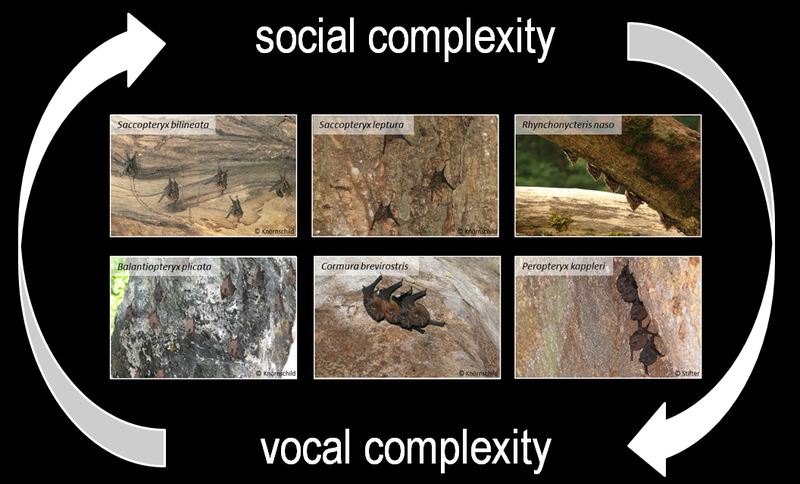 Social interactions require communication and interspecific differences in social complexity may explain the observed variation of vocal repertoire complexity in different species (Dunbar 2003, Pinker 2003). While this proposition apparently applies to primates (McComb & Semple 2005), marmots (Blumstein & Armitage 1997), herpestids (Le Roux et al. 2009) and certain birds (Poecile; Freeberg 2006), little evidence has been found so far in bats (reviewed in Wilkinson 2003). This could be due to the lack of comparative studies incorporating both behavioral observations on indicators of social complexity (e.g., behavioral repertoire size, group size, composition, and stability) and genetic analyses to assess the impact of sexual selection on social complexity and, accordingly, vocal complexity. (1) Vocal complexity is dependent on the respective mating system type, with polygyny requiring a bigger vocal repertoire than monogamy. (2) Mechanisms to acquire vocal repertoires are dependent on vocal repertoire size, with vocal learning occurring only in species with large vocal repertoires.